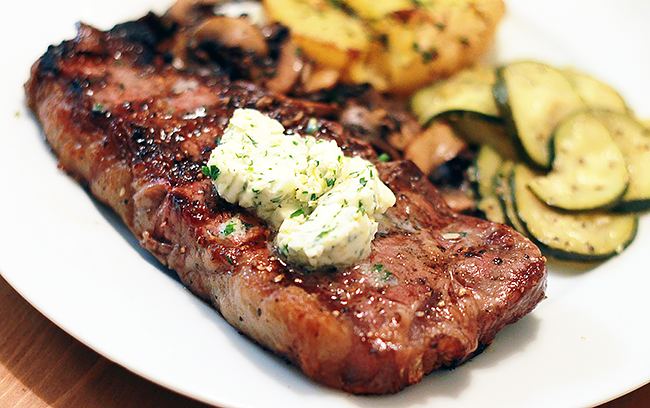 Labor Day is coming up this weekend so I thought what better way to celebrate the end of summer than with a delicious grilled steak topped with a fresh herb butter? Combine softened butter, lemon zest parsley (I just grab a good handful! )– you can also use basil, rosemary, or any other herb you have on hand– into a bowl. Either stir to combine or use a mixer to to whip it all together. Add lemon juice and mix once more until evenly mixed. Scoop the butter out onto a long piece of plastic wrap over a long piece of foil. Start rolling and form a cylinder, then twist the ends up to pack in tighter so the butter forms a tube shape. If you need it hardened right away, put it in the freezer, if not keep it in the fridge to set. Slice off and serve on top of your steak– enjoy this mouth-watering goodness! I have also used a pat in my mushrooms or other veggies to pump up the taste. Yummy!